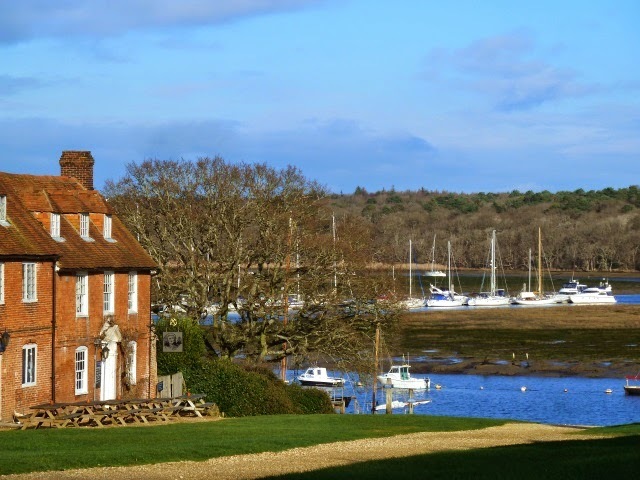 A winter walk though the New Forest to the old ship building village of Buckler's Hard is one of our favorites, when the summer crowds are absent and the village looks pretty much as it did 200 years or more ago. 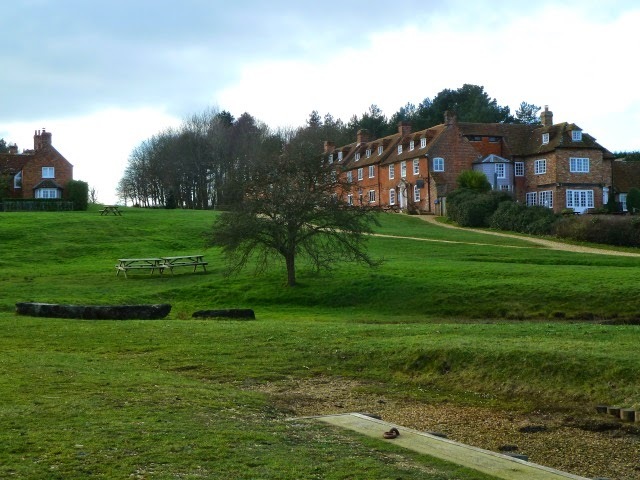 The sloping main village comprises a row of Georgian houses which have been preserved as part of the Beaulieu estate. The hard under the control of Master shipbuilder Henry Adams was responsible for building many famous ships during the late 18th century and early 19th centuries, including HMS Euryalus, HMS Swiftsure and HMS Agamemnon, all of which fought at the Battle of Trafalgar in 1805. 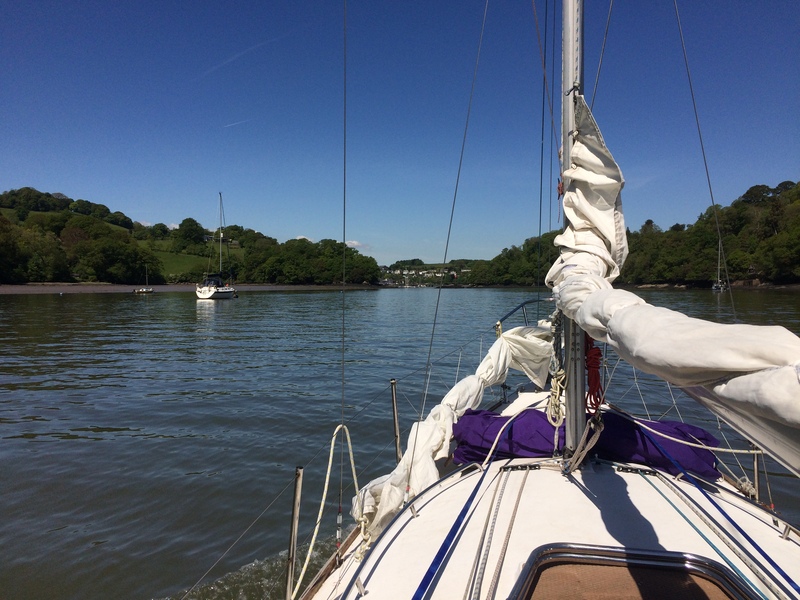 Seen below the ships were built here using abundant oak from the surrounding forest. 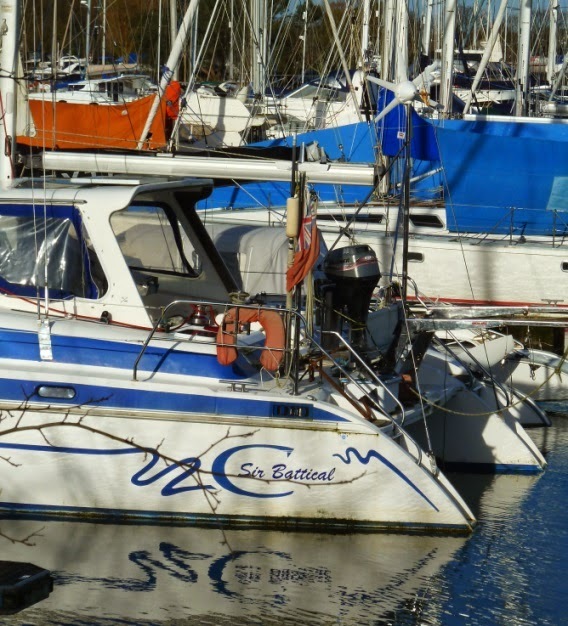 I received an email from Tim asking if I could help identify a boat he has which is is definitely SCOW like. The builders plate says Burnham Motor Boats Ltd, marine specialists Burnham on Sea so certainly not a local boat, then again Erica's SCOW was built in Nottingham of all places. While it certainly looks like a SCOW, Tim's measured her at exactly 12 feet which is a little oversize. 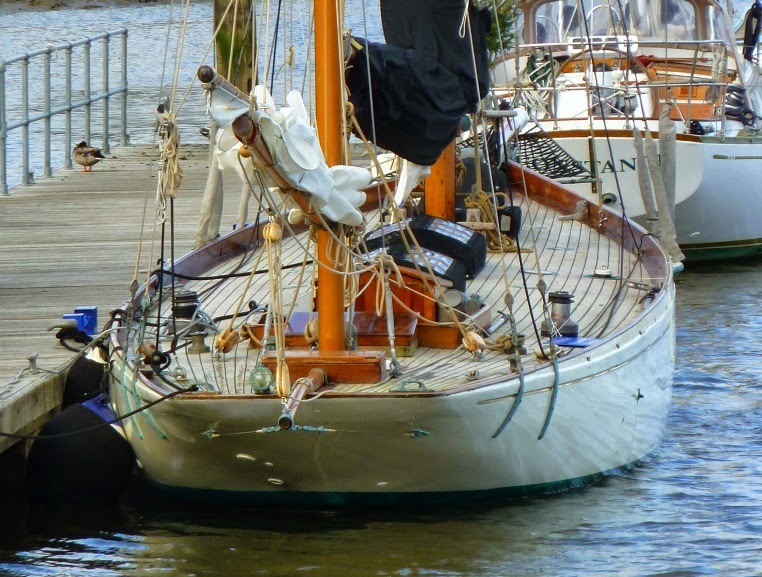 The Chichester SCOW is 11'5" while the Lymington SCOW is 11'4". Stored in a boat shed on the Scillies, apparently the boat hasn't been in the water for over 42 years. 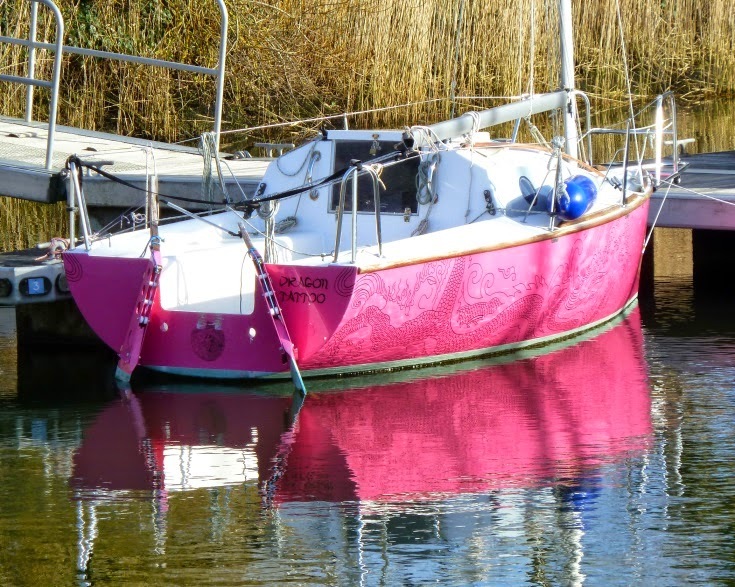 Tim has brought her back to Fareham and is looking for a new owner to take her over. 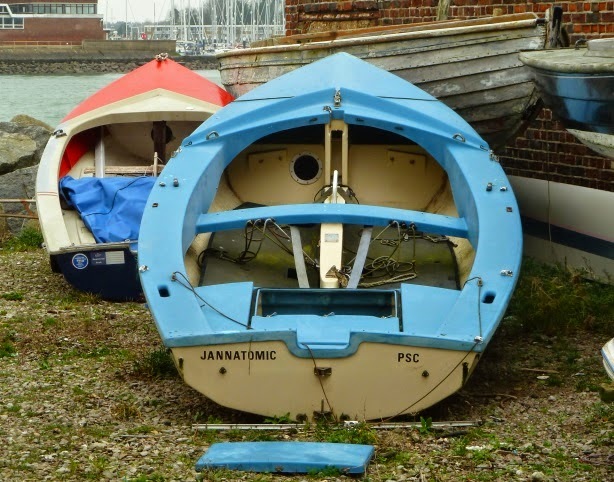 There are more details here on the Classic and Vintage Dinghy Association forum , if you fancy a SCOW like classic dinghy get in touch with Tim. I was up early enough to catch the best of the day on Sunday, the night had been clear and bright and the morning was clear and cold with a heavy frost on all the exposed areas. 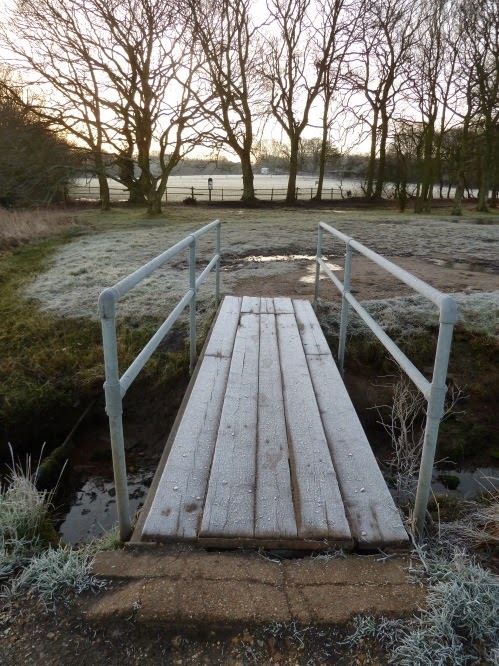 I was clearly up early, there was only a single set of footprints disturbing the frost on the old bridge. 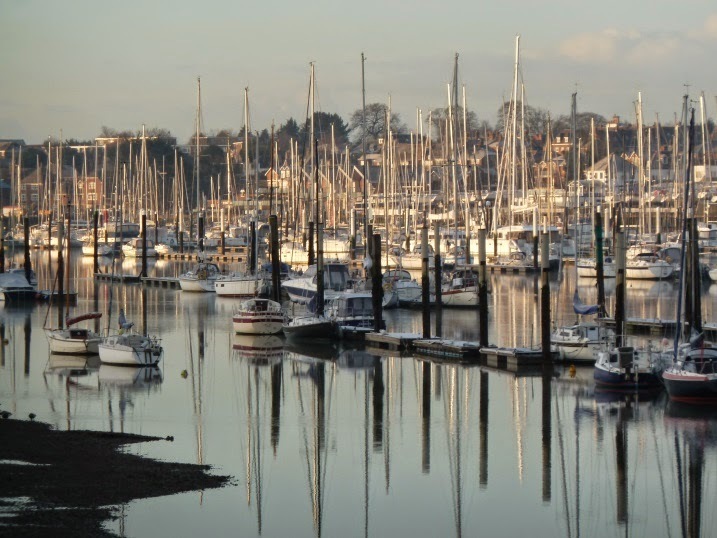 Gradually the sun started to rise over the trees on the eastern shore and light up the boats and Hamble village. 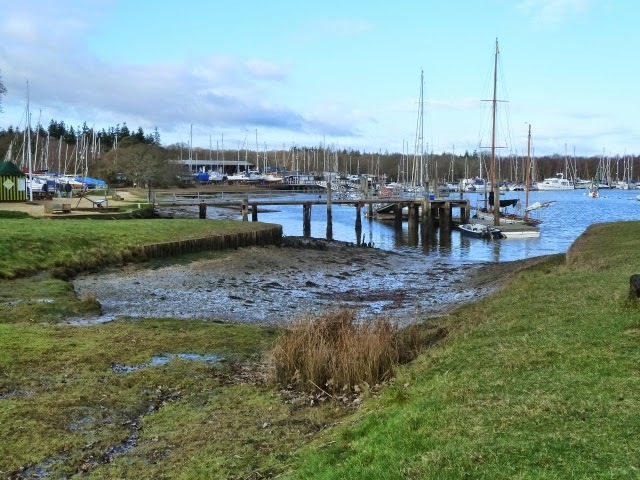 There was no sign of the flooding which has been making press headlines, the pathway showed signs of being covered but no more than is normal on a big spring tide. Today's gale force winds are forecast to come through around low water so maybe we will be spared the combined effect of wind and high tide. By the time I was on my return leg the sun was up and bright. The clouds are already starting to fill in and rain is forecast by midday, but a morning run in the cold crisp air was a great start to the day. 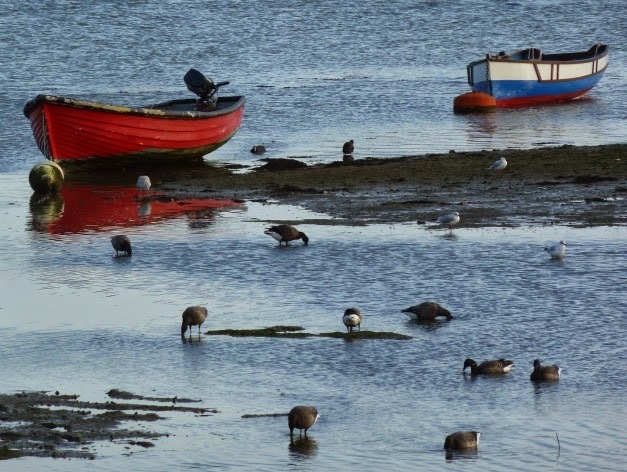 With the recent cold spell both the local and visiting wildlife have been making the most of feeding opportunities, like this busy day at Emsworth when the outgoing tide had just revealed the mud and the no doubt abundant and tasty supply of food. 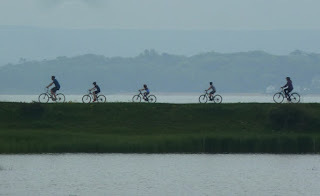 With the milder weather things appear a little less frenetic and in a few weeks no doubt some of the northern visitors will be heading back to cooler regions. It was nice to see them while they were here. I have to admit I like micro yachts , if that's the right description. With no builders name in sight I don't know what this boat is but I'm guessing 18 to 20 feet, twin rudders, it looks easy to sail, fast and fun. I especially like the paint job not least because it's pink, but the tattoo dragon on the topsides really make it special. I don't know anything about her, couldn't get anywhere to get a decent photo. 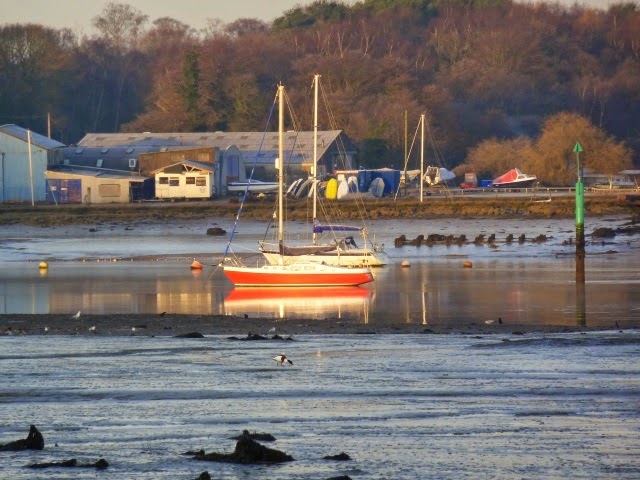 Seen at Buckler's Hard over Christmas - hence the tree if you were wondering. 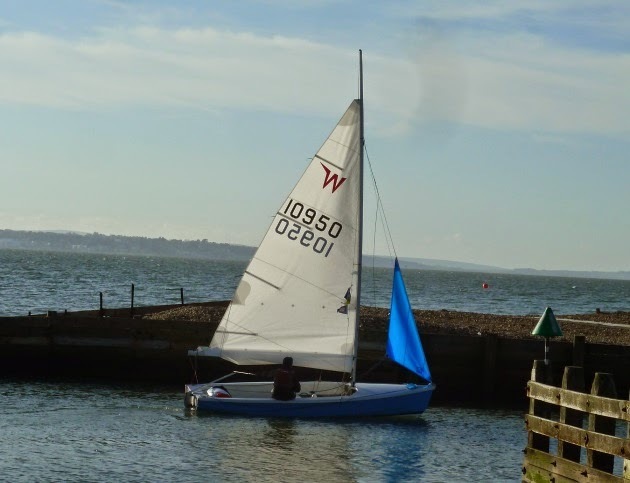 Possibly the UK's most popular cruising dinghy, largely due to the exploits of Frank Dye who famously sailed an early wooden wayfarer on open ocean voyages as far as Norway and Iceland. Designed by Ian Proctor in 1957 the wayfarer was originally built in plywood and subsequently in fiberglass, with over 10,000 being built. In addition to cruising and day sailing the Wayfarer is actively raced with a PH number 1101. 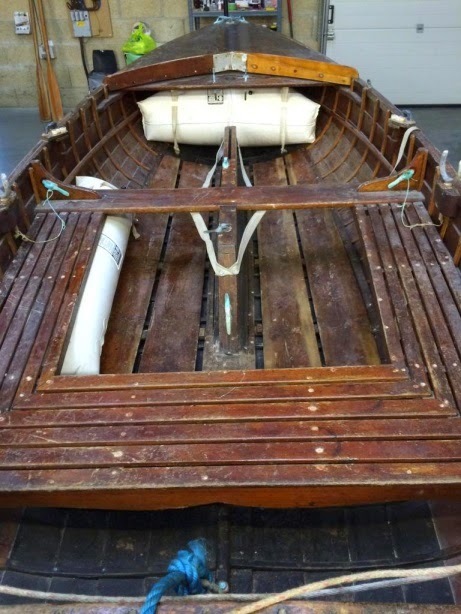 We owned a wooden Wayfarer number W176 some years ago, it was almost identical to Frank Dye's boat number W48 which is in the National Maritime Museum in Falmouth. 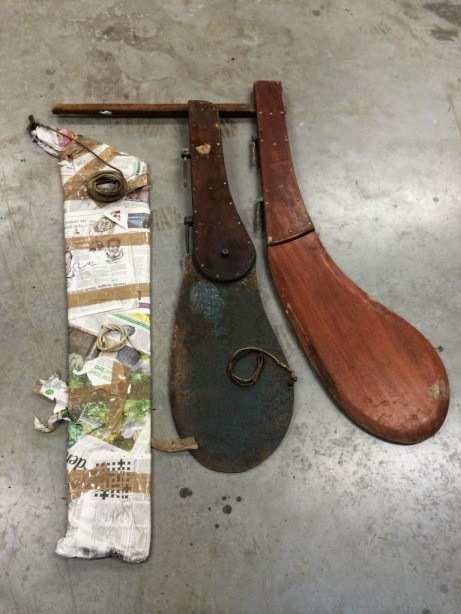 Ours was a great boat, a bit heavy to launch and recover and could be a handful to sail single handed when the wind got up ( a couple of 25 litre water containers strapped under the center thwart improved things). latitude 50.47.25 North - Longitude 1.6.25 East. Sadly the door has been blocked up but what a great entrance it once was. 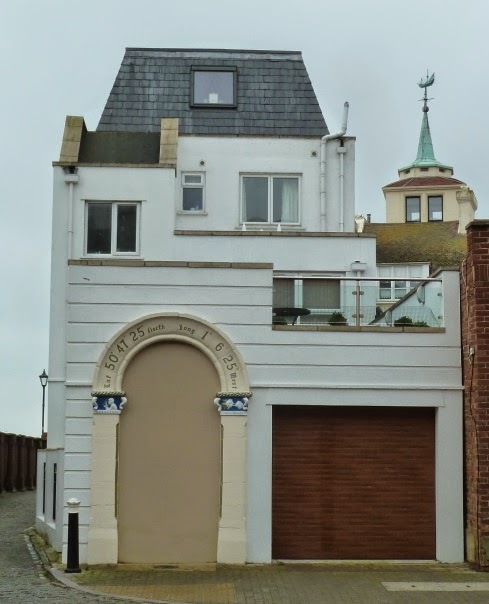 The house is located just off the waterfront in old Portsmouth. It sure beats the normal postcode. Opus has been on the river as long as I can remember, carvel built with a raised topsides forward of the cockpit, she's unusual and notable. 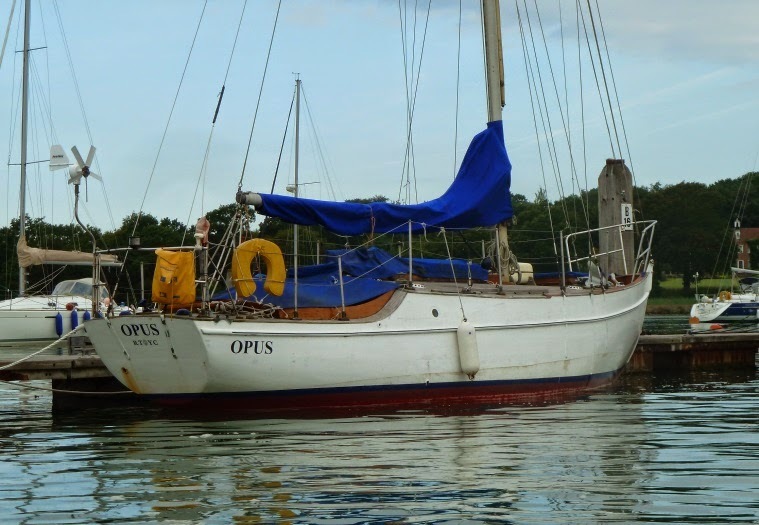 The 1968 OSTAR Observer Single handed Transatlantic Race lists yacht Opus 32 feet LoA and sailed by Brian Cooke finishing overall 6th but finishing 3rd on corrected time. 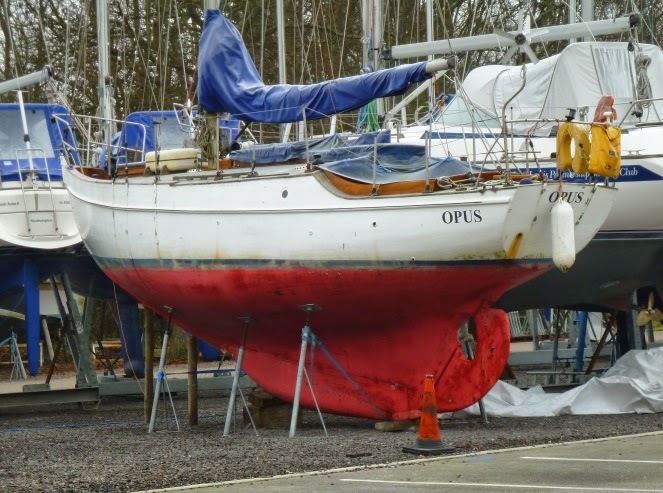 Whether this is the same boat or not I don't know, other than that the result information seems to be very scarce, but the boat shows Royal Thames YC membership which back in the 1960's was one of the leading racing clubs of the day. If anyone has more information please drop me and email. 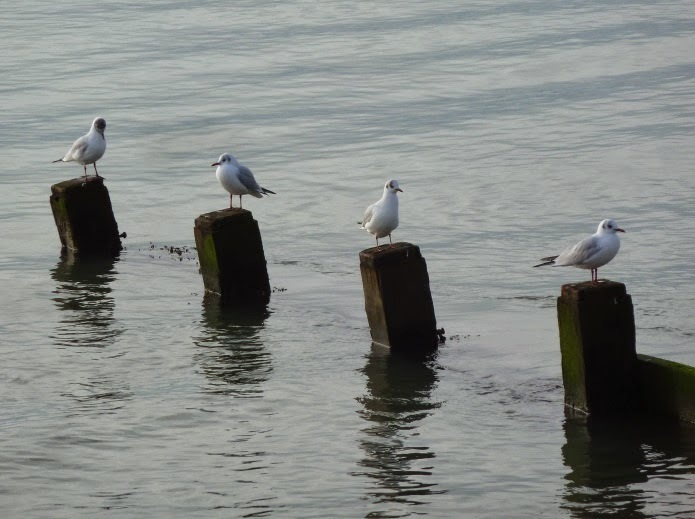 I couldn't think of a clever caption, I just like the way these gull are looking around. If I were Tillerman I would probably have issued a caption competition t my fellow bloggers. 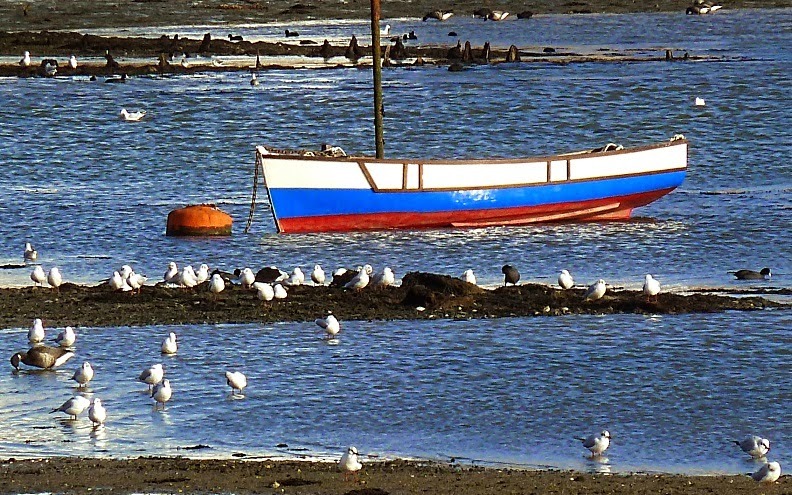 Picture taken near Hill Head harbour. 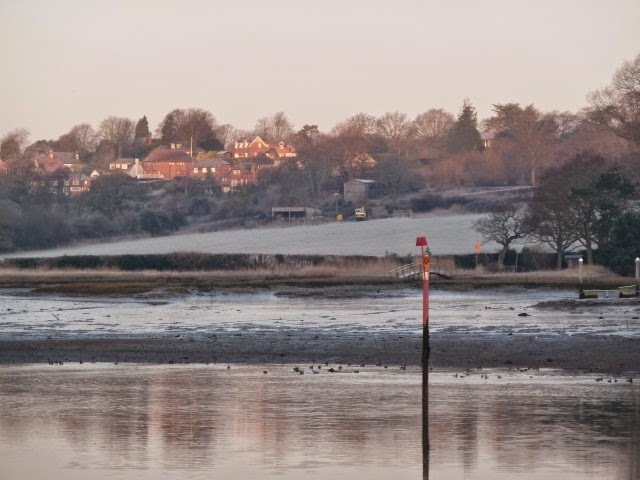 A cold winter's day is great for getting out in the New Forest, away from the tourist hot spots of Beaulieau, Lyndhurst and Brockenhurst you can pretty much have the place to yourself. 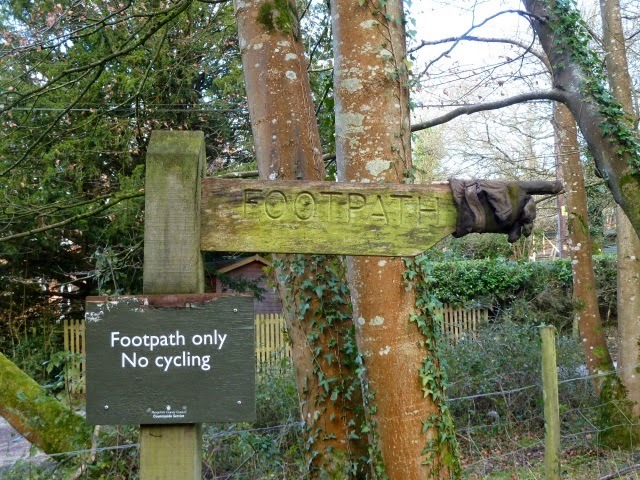 We took the path leading out of Minstead towards Acres Down, which was fortunately well sign posted. 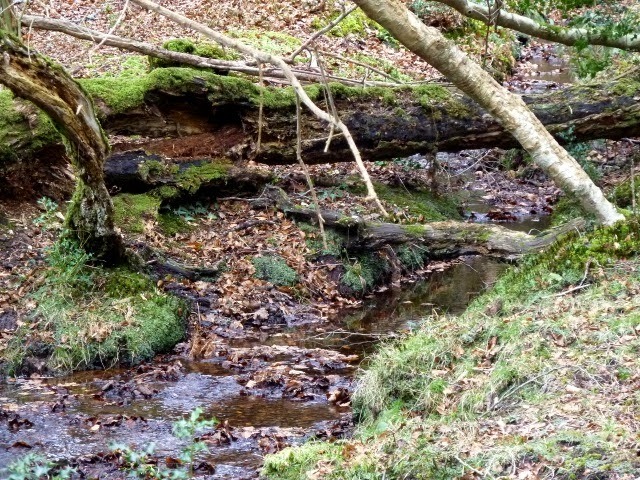 I find these woodland streams a source of endless fascination, especially in winter when the reflected light and gentle movement are such a counter point to the still bare trees and dead leaves. 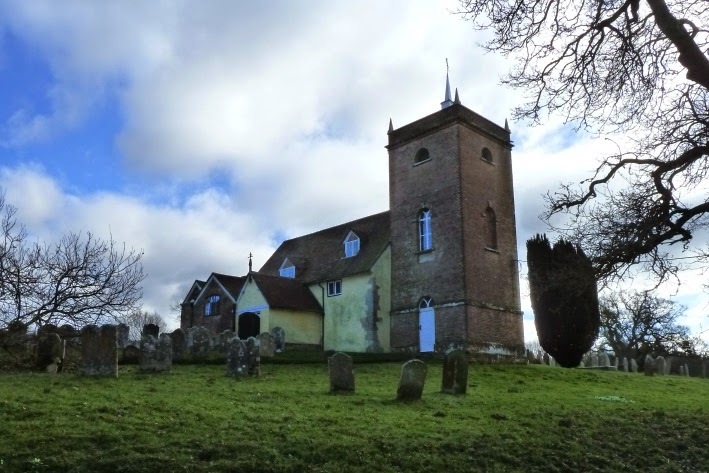 All Saints church in Minstead is lovely but something of a curiosity, it's the resting place of sir Arthur Conan Doyle, creator of that most famous consulting detective Sherlock Holmes. Dating back to Norman times the church looks more like a cottage which has slowly morphed into a church as additional parts such as the tower, have been added over the years. 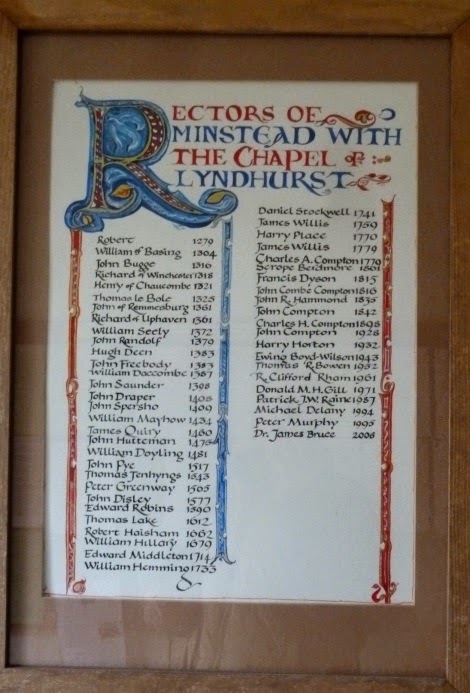 Inside the list of the current and past rectors dates back to 1279. My American boss asked me recently why it's called the New Forest which is a good question since it was created or rather claimed as a hunting area by William the Conqueror in 1079.